Joyalukkas Lifestyle Developers is breaking new grounds in the real estate landscape of Kochi, the commercial capital of the southern Indian state of Kerala, with Gold Tower. 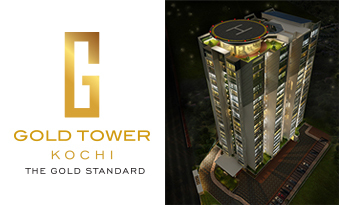 Joyalukkas Group has ventured into real estate sector by launching 'Gold Tower' a premium residential project nearby Vazhakala in Kochi. KOCHI, DEC 18: Joyalukkas Group, the multi-billion-dollar global conglomerate, has entered the real estate sector by launching a residential project in Kochi. Kochi: The Joyalukkas Group has ventured into the real estate landscape of Kochi with Gold Tower, a premium 3/4 BHK, 22-storeyed apartment block by Joyalukkas Lifestyle Developers. Gold Tower will come up in Vazhakala, at a prime location that is just a stone’s throw away from all conveniences. Kochi - 682 030, Kerala - India. © 2017 www.joyalukkasdevelopers.com All rights reserved.